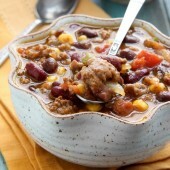 A hearty Fall chili, loaded with pumpkin, spices and a hint of beer. Cook and crumble beef in a large skillet, seasoning with 1/2 tsp salt and 1/2 tsp pepper. Drain of any excess fat. Transfer beef and all remaining ingredients to the bowl of a 5-6 quart slow cooker. Stir gently to combine. Cook on high for 4 hours or low for 8.